These (3) snap frames stand tall on an 8 foot pole! This display is 8 FEET TALL! This display holder promotes your advertisements with style! 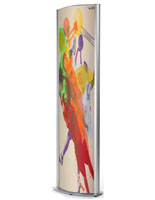 This display holder is constructed of fine aluminum and offers a simple but posh image. 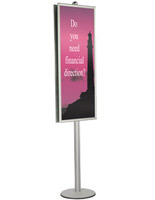 This display holder is 8ft tall, towering over other poster stands. 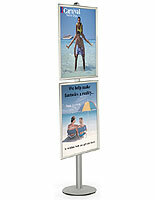 The poster frame, also known as a display holder, has a weighted base, providing total stability. 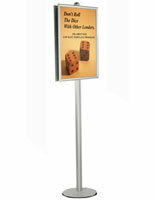 Poster stands are great for crowded and large venues like convention centers, exhibition halls, trade shows and lobbies. 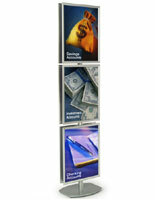 This display stand has three 22"w x 28"h snap open poster frames. 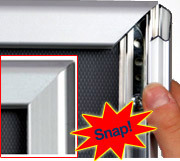 The snap frame is front loading, specially crafted to make frequent graphic changes easier. Simply snap open all four sides, place your 22"w x 28"h graphic inside, lay the protective plastic lens over it (included), and snap the sides closed. The plastic lens protects the graphics and is free of reflection. Compared to other display holders, this display holder is unique because the height of the poster stand is adjustable. At the back of each frame, there is a channel that runs into the pole. It can be set higher or lower as needed. The base of the stand has rubber edging to protect floor surfaces. This display holder is shipped unassembled, with easy assembly instructions provided with the stand.